Concussion - body, last, causes, What Causes Concussion? Concussion, or brain concussion, is an injury to the brain caused by a blow to the head or by violent jarring or shaking. It is a form of head trauma that often involves loss of consciousness, which may be momentary or may last for several hours. Brain concussion is a common injury that may sometimes have serious consequences. Most people who watch sporting events on television have seen team physicians run out to the playing field to examine athletes who receive blows to the head. The doctors often ask the injured players if they know where they are or what day of the week it is. That is one way that doctors find out whether people have concussion. A blow to the head, an injury, a fall, or sudden severe shaking may cause the brain to hit the inside of the skull. If the impact affects the consciousness centers in the brain stem * , then the person with concussion loses consciousness. This may happen if, for example, one boxer's knockout punch makes the other boxer's head accelerate sharply, or if someone's head decelerates suddenly, as when it strikes the ground during a fall. Sports are among the most common causes of concussion, and sports with the most physical contact, such as football, boxing, and hockey, are most likely to produce head injuries that involve concussion. Concussions may also occur during collisions or falls in basketball, soccer, and baseball, or while riding motorcycles or bicycles. About half of all head injuries are caused by motor vehicle accidents. A large percentage of these accidents involve drivers who have been drinking alcohol. Other causes include fights and industrial accidents. * brain stem is the part of the brain that connects to the spinal cord. 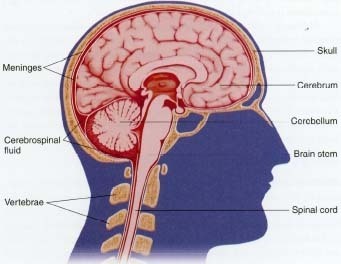 The brain stem controls the basic functions of life, such as breathing and blood pressure. What Happens to People with Concussion? Concussion does not always cause complete loss of consciousness. People who get mild concussions may be temporarily stunned or dazed. They may feel dizzy, light-headed, or confused for a brief time. With loss of consciousness may also come nausea or vomiting, numbness, blurred vision or temporary blindness, or amnesia, which means loss of memory for events just before or just after the injury that caused the concussion. Concussion may result from sudden traumas, such as motor vehicle accidents or sports injuries, that cause the brain to hit the inside of the skull. as soon as possible. The symptoms of concussion usually do not last long, but in rare cases they may persist for several weeks or longer. Do People with Concussion Need Medical Treatment? Permanent brain damage does not normally result from a single mild concussion, but a doctor must first make sure that there has not been a more serious head injury, such as contusion (bruise) or laceration of the brain. The doctor usually asks about the injury that caused the concussion and notes the person's signs and symptoms. Sometimes people worry that it is unsafe to fall asleep after a concussion, but doctors usually advise a period of bed rest, either at home or in a hospital, and no sports or riding a bicycle until recovery is complete. If headache is a symptom, the doctor may suggest pain medication. People with concussion should not drink alcohol or take sedatives * . If unconsciousness, headache, or drowsiness return several hours or days after the injury, it is important to see the doctor again. The doctor may recommend hospital treatment or may diagnose postconcussion syndrome. People who have had a concussion are at higher risk of severe injury, or even sudden death, if they get a second concussion within a short time after the first injury. Under these circumstances, avoiding possible head trauma becomes vitally important. Headache, dizziness, and other symptoms of concussion usually go away in a few minutes or days. Occasionally, however, they may persist much longer, even for years. The person may complain of a group of symptoms including not only headache and dizziness, but also confusion, poor memory, anxiety, sleeplessness, irritability, lack of energy, and depression. A person with this group of lasting symptoms following a concussion is said to have postconcussion syndrome * . Although postconcussion syndrome is not well understood, many medical researchers believe it may be the result of subtle changes in the brain that do not show up in medical tests. Because brain tests are normal, people sometimes believe that postconcussion syndrome is due to psychological factors or that people with postconcussion syndrome are faking their symptoms, especially if they are attempting to win damages in a lawsuit. This may be so in some cases, but often postconcussion symptoms exist in the absence of a lawsuit or persist after a settlement has been reached. * syndrome means a group or pattern of symptoms that occur together. How Do People Prevent Concussion? Wearing a helmet is the best way to prevent a concussion in most situations where it might occur. Boxers are at high risk to receive this type of injury, and that is why they always wear protective headgear during training matches. The same is true in football, hockey, and other sports where there is a lot of physical contact, or where falls are likely. Bicycle and motorcycle riders also need to wear helmets to protect against serious head injury in case of a fall or collision. In automobile accidents, seat belts and air bags can prevent riders from banging their heads against the windshield or dashboard. Many accidents can be prevented if adults who drink alcohol designate (choose) a nondrinking friend to drive them home after they have been drinking; this person is called a "designated driver." Boxers are sometimes called "punch drunk" if they develop slurred speech and poor concentration after receiving repeated punches and blows to the head during their careers. Repeated concussions can cause an accumulation of injuries to the brain and may result in permanent damage. Kulstad, Scott. Sports Medicine for Young Athletes: A Guide for Parents, Teachers, and Coaches. Minneapolis, MN: Institute for Athletic Medicine, Fairview Press, 1998. A useful book that includes a section on concussions. Levy, Allan M., and Mark L. Fuerst. Sports Injury Handbook: Professional Advice for Amateur Athletes. New York: John Wiley and Sons, 1993. Covers head and neck injuries, with separate chapters on sports with the highest risks of concussion. Micheli, Lyle J., with Mark Jenkins. The Sports Medicine Bible: Prevent, Detect, and Treat Your Sports Injuries Through the Latest Medical Techniques. New York: Harper Perennial, 1995. Discusses head injuries and preventive measures.